a) the popular table top model. b) the hand held model. The table top model is complete with a water reservoir and holds the paper tape rolls between guide rollers while the operator pulls the tape through the guides and over the water application roller. This moistens the tape ready for the manual application to the veneer. 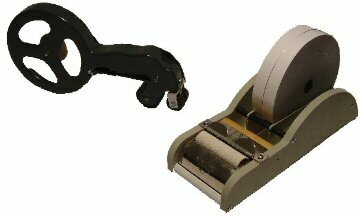 The hand held unit uses a sponge to moisten the paper tape and applies the tape straight from the unit to the veneer. Two rubber rollers are situated at the front of the unit to assist in alignment.